The Clean Air Act, last amended in 1990, requires the Environmental Protection Agency (EPA) to set National Ambient Air Quality Standards (NAAQS) for pollutants considered harmful to public health and the environment. 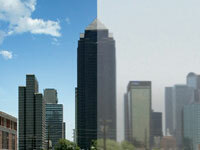 The Clean Air Act established two types of standards for these major air pollutants: primary and secondary. Primary standards set limits to protect public health, including the health of "sensitive" populations such as asthmatics, children, and the elderly. Secondary standards set limits to protect public welfare, including protection against decreased visibility, damage to animals, crops, vegetation, and buildings. The EPA Office of Air Quality Planning and Standards (OAQPS) established NAAQS for six "criteria" pollutants: carbon monoxide, lead, nitrogen dioxide, ozone, particulate matter, and sulfur dioxide. The Dallas-Fort Worth region is in nonattainment for the pollutant ozone. Ozone in the upper atmosphere, or "good ozone," is beneficial as it serves as a protective layer, blocking out damaging ultraviolet rays from the sun; however, ground-level ozone is potentially harmful. In fact, clinical studies indicate prolonged exposure to elevated levels of ground-level ozone may actually reduce lung function, increase the frequency of asthma episodes, and reduce the body's ability to resist respiratory infections. In addition to threatening human health, high ozone concentrations pose a risk to the environment, wildlife, agriculture, and can degrade built structures in the region. In addition, failure to meet federal standards for air quality could result in additional emission-control requirements that will unfavorably affect local businesses. It may also result in a freeze on federally funded transportation projects, costing the region upward of billions of dollars in lost transportation funding. This would ultimately affect jobs in the region and cost money in lost productivity due to traffic congestion delays. See the links below for complete details on ozone and the region's ozone status. Follow the links below for more information about the other criteria pollutants, such as the sources of the pollutant, its health effects, and control strategies. The Texas Commission on Environmental Quality regulates monitors throughout the region to measure and analyze these pollutants. These Continuous Ambient Monitoring Stations (CAMS) measure various types of pollutants and weather parameters. To learn more, visit TCEQ's Air Monitoring Sites web page.